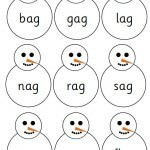 CVC words follow the pattern ‘consonant-vowel-consonant’. They are a great starting point in allowing children to practise combining individual letter sounds together to create meaningful words. They help consolidate a child’s letter/sound knowledge and give them practice at manipulating and combining sounds. The focus should be on hearing and sounding out each of the three sounds in CVC words. Find a CVC word list here. While CVC words can be used to consolidate letter-sound knowledge, they are also a great starting point when focusing on applying this knowledge. Working with CVC words gives children opportunities to combine letter sounds together to make familiar words. CVC words are also great for the important skill of sound manipulation. This means being able to alter one sound in the word while keeping the rest of the word the same. For example, being able replace the ‘t’ with a ‘c’ in the word ‘tap’ to create ‘cap’. Use a whiteboard to write down a CVC word, say the word, rub the first letter off and replace it with another letter. What word does it make? For a challenge, you can try the same activity but replacing the final letter instead. CVVC words are words with two vowels in the middle. These words often contain a ‘long vowel‘ sound, such as rain. 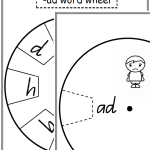 Find out more about CVVC words as well as long vowel sound activities and worksheets here. 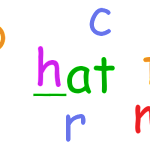 CCVC and CVCC words are words that begin or end with a blend or digraph. 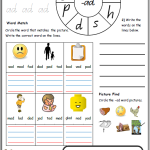 Blends and digraphs are explained in more detail here. Simply put, they’re words that begin or end with two consonants, like chin, or mash. We have a huge range of printable CVC worksheets and CVC activities. Fun, easy to use and provide valuable practice for your child. Suitable for preschool, prep, grade 1, 2 and 3. Find our complete collection here. This is fantastic. Another home run from keep kids reading. Thanks to the hard working admin! Glad you’ve found our resources useful!